"Nowhere has a more persuasive case been made for the inclusion of Bruch’s Second Violin Concerto in the standard concert repertoire. Yet, strange to relate, this could well have been the only occasion Jascha Heifetz performed the work with orchestra, though he had taken it in his portfolio of works for recital performance. That may have also been true of Spohr’s Eighth Concerto which he treats as a virtuoso display showpiece and very different to the restraint the work would receive today. So you may well think that it was Bruch’s First Concerto that had been the major work in his repertoire. But having played the concerto in public at the age of twelve, for many years he preferred Bruch’s Scottish Fantasy which he recorded three times. It was in his late thirties that he again began playing the concerto regularly. 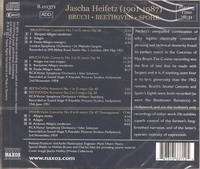 The present recording, which dates from 1951, was soon to be overtaken by Heifetz’s version in the latest stereo sound, the work’s recommended disc for many years. As the writer of the accompanying notes rightly claims, the earlier one—both were recorded in London—was the more spontaneous, and there is an extra warmth and relaxation in the central Adagio. Technically his playing was superb in both performances, and in this earlier version he had the London Symphony conducted by Malcolm Sargent in fine form. Abbey Road engineers met his demand to be placed well forward of the orchestra, but they also ensured a very weighty accompaniment. Would that the remainder of the disc, recorded in Hollywood, were half as good, Heifetz’s violin tone sounding pinched and acidic, the orchestra somewhere in the background. Still those who want to hear this most legendary of all violinists, I would commend these excellent transfers to CD."